You may not be aware of the term djent, but the chances are you're going to be hearing a lot more about this scene if you're a fan of progressive metal. 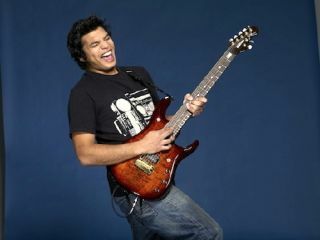 Leading the pack of talented seven-string players in the scene is Misha Mansoor (aka Bulb) of Periphery. Misha's dedication to improving his craft and tone is covered in more depth in a forthcoming Guitarist magazine Fretbuzz piece, but he's a prime example of a player who has taught himself advanced rhythm technique from becoming a home recordist early on and honing his style from there. Don't let his technical chops fool you either, he likes his textural tones and is prone to show his hand now and again as a notably expressive lead player too - taking inspiration from Holdsworth and Petrucci. In addition, our recent meeting with the affable Misha before the first ever Periphery UK show in Bristol confirmed he was a gear addict - a huge fan of Fractal's Axe-Fx unit (used for Periphery's self-titled debut and live shows), UK pickup manufacturer Bare Knuckle and whatever custom seven-string models he can lay his hands on from around the world. This video is a classic example of another admirable element of his attitude as a guitarist - he's more than happy to share his enthusiasm for playing and his knowledge with other players. His fans wanted to know how he played the Periphery song Insomnia, so he filmed himself playing the main parts (complete with his phone ringing in the background!) and went on to directly answer their questions in the comments section for the video on YouTube. If this is the new breed of metal guitar hero - the future looks great. For more on the prolific Misha's work under the name Bulb, and to hear his musical works in progress, visit his Soundclick page.